LAS VEGAS — The display case just inside the front door is filled with the kind of stuff you would find at any sports memorabilia store. Frank Hawkins used to run interference for Marcus Allen back in the day, and there are plenty of signed footballs and pictures of No. 27 in silver and black. There’s a picture of Hawkins with a former governor of Nevada, and a drawing of the late Raiders owner Al Davis with signatures from players on it. Next to them is a team photo from 1983, and a championship banner with the result of that season’s Super Bowl: Raiders 38, Redskins 9. A few feet to the left is what is called the “smell room,” one of many signs that this is no memorabilia shop. Hawkins didn’t set out to be in the marijuana business in the town where he grew up and later became a city councilman. He resisted it at first, mostly because he says he doesn’t smoke the stuff. Now he sits in a back office at Nevada Wellness Center just a few blocks from the glittering Las Vegas Strip, amid strains of marijuana with names like Devil’s Lettuce, Silver Back Gorilla and Black Afghan. It’s all legal in a city where almost everything goes. But Hawkins — who opened the first medical marijuana dispensary in town — says it hasn’t been easy. That changed on July 1 when Nevada became the fifth state to legalize recreational marijuana. Marijuana shops, which had been competing for a few thousand customers who had medical marijuana cards, could now sell to anyone — including tourists — over the age of 21. That meant long lines on opening night at the shop Hawkins owns with two partners. It also meant a lot of cash in an industry where, as the sign in the lobby tells customers, business is all conducted in cash. Things were slower on a recent summer afternoon, when only a few customers came in and headed to the smell room to get a whiff of what they might buy. And Hawkins thinks it can be beneficial to football retirees and current players as an alternative to opioid painkillers. Though undersized at 5-foot-9 and 210 pounds, Hawkins ran for 5,333 yards in four years at the University of Nevada, Reno. The Oakland Raiders drafted him in the 10th round in 1981. He stuck with the team and showed some promise, but the next year the Raiders were salivating over the chance to get the Heisman winner. “The running backs coach said, ‘You guys ever hear of a guy named Marcus Allen?” Hawkins recalled. Hawkins became, “a battering ram.” For the next six years, he led the way for Allen. He got some carries of his own, though, and scored two second quarter touchdowns in the AFC Championship game to break open a close game to put the then Los Angeles Raiders in the Super Bowl. The Raiders would meet the Washington Redskins in Tampa Bay for the championship. They had Jim Plunkett and Allen in the backfield, but most importantly they had an attitude. The Raiders wore black, and were so dominant the game would become known as “Black Sunday.” Allen ran wild behind Hawkins for 191 yards. Hawkins ran three times for six yards and caught two passes for 20 more. He won a Super Bowl ring he only brings out on special occasions. The Raiders of past gathered in July in wine country in Northern California, where the team trains. There were 110 former players and the talk was about old times and the resurgence of the team under Mark Davis, son of the late owner Al Davis. There was also talk about various ailments, and the possibility some former players might have CTE or other brain damage. So were many of the players at the reunion, one reason they were quite interested in the business Hawkins is in. Marijuana is still a punishable offense in the NFL, and players are subject to suspensions with a second positive test. Pain pills, on the other hand, are readily available for almost any kind of injury. With the nation immersed in an opioid crisis, a 2011 study showed retired players misuse opioid pain medications at a rate four times that of the general population. 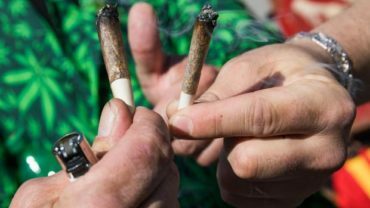 Marijuana, a growing body of research indicates, can reduce pain more effectively than opioids and may be beneficial for concussions. It’s done not with the mind altering Tetrahydrocannabinol (THC) in the drug, but the cannabis compound Cannabidiol, or CBD. NFL Commissioner Roger Goodell was for years a hardliner on the use of marijuana but said last month he has reached out to the player’s union and is willing to fund a study to see if there are benefits. Hawkins said he doesn’t need a study to be convinced. After a recent hip replacement surgery he had blood clots in his legs that his doctor was treating for six months with blood thinners. A woman at his shop suggested he try capsules containing CBD that dissolve in water. After taking them for a few weeks, Hawkins said a body scan showed the blood clots had disappeared. 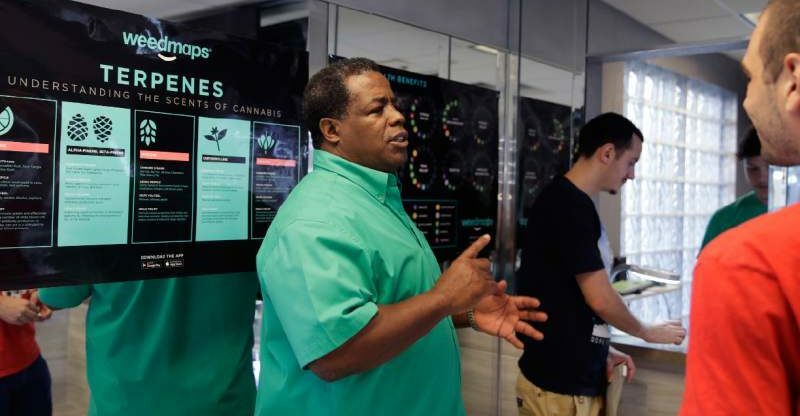 Hawkins estimated 20 percent of current players — some of whom have come into his shop — are using some form of marijuana to relieve pain and inflammation. Hawkins considers himself relatively healthy, though he’s quick to show off scars, including one from a tendon that separated in a 1987 game, eventually leading to his retirement. He still loves football, though if he had a son he wouldn’t let him play. He’s not so enamored with the NFL, which he believes knew long ago the effects of hits to the head but did nothing about it. Hawkins also understands people may view him differently because he sells marijuana. He says he’s OK with recreational use, though it’s the medical side he’s most excited about.